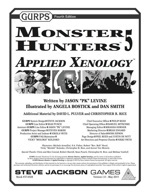 What does May hold for everyone's favorite infinite-possibility roleplaying game? Well, for this month's GURPS, not even the sky's the limit! 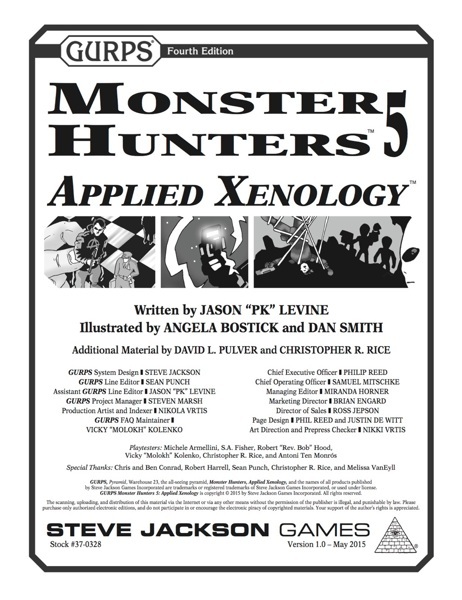 Our first release will be GURPS Monster Hunters 5: Applied Xenology, a collection of options and choices that brings your GURPS Monster Hunters game into horrific scientific realms. See how that series' typical champions can be adapted to a more technological bent! Learn how Ritual Path magic can become technomagic! Face terrifying alien threats and conspiratorial menaces! And much more! Is that not out of this world enough for you? Toward the end of the month, the next issue of Pyramid will be within full sensor range. Initial readings indicate that it's a collection of alien worlds and otherworldly threats. Visit strange new planets, denizens, and cultures. Drop by on the way elsewhere, stay for an adventure, or use a locale as the basis for an entire campaign. You can prepare yourself to beam these goodies aboard by subscribing now and being among the first to get it delivered automatically as soon as it's released. If it's science-fiction GURPS gaming goodness you want, this May be the month you've been waiting for!